While most of our organic gardening friends in the National Organic Harvest 2015 project are bringing in the vast majority of their harvest right now, we’re not. Our big harvest time is June and July and then we wait a few months and start planting the fall garden. Right now we are harvesting peppers, basil, okra and moringa. This week’s theme for #OrganicHarvest15 is Eating the Harvest Fresh. I thought it would be fun to talk about how to do that during the transition time from one season to the next. I personally think the most important thing to do in order to eat as much of your harvest fresh as possible is to change your ideas of what exactly makes a meal or side dish. 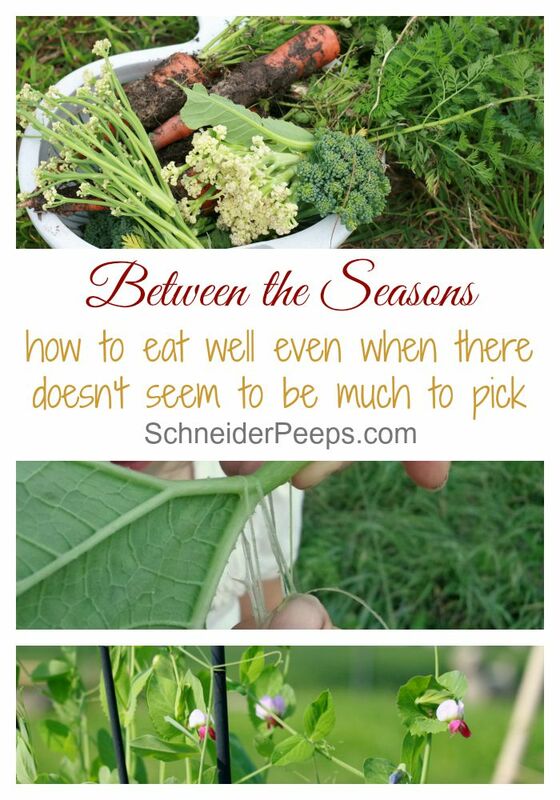 This is especially important at the beginning of the season and at the end of the season when you don’t get full meal size picking of any one vegetable. It’s easy when you’re bringing in baskets of green beans each day to make enough for a meal, even for a large family. But what happens when you only get 10 green beans? Sure you can put them in the refrigerator and hope you pick more before they dry out and wilt, but why chance it? You can mix different vegetables together and saute them. It really is okay to have your vegetables mixed up instead of just one type as your side.I like to do this and serve it with rice, or in pancit, lasagna or chicken alfredo. I almost always add onion, garlic and carrots to whatever vegetables we are harvesting. I love how Homestead Lady used the beginning of strawberry season and thinning the beets as an opportunity to treat her family to a salad that they don’t normally get. You need to leave enough leaves on the plant that it can continue to grow, but it’s perfectly okay to harvest the leaves before the fruit is ripe. Our Kenyan friend showed us how to peel the squash leaves to prepare them to cook. Basically you take all the spiny parts off by pulling the veins on the underside. You can also pick the outside leaves of cabbage before it it starts making the head. Again, don’t pick so much that it never makes a head but you can pick a couple off each plant and it will be fine. 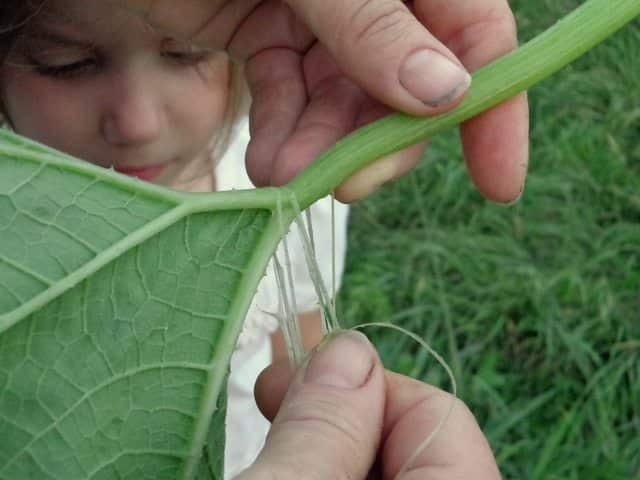 So, how do you cook these leaves or secondary edible parts of the plants? Everything starts with an onion. Onion is your best friend when it come to cooking greens of any kind, and these leaves are no exception. Sometimes I will just saute an onion and chop the greens up and toss them in the pan along with some grated carrot or chopped tomato. Add some real salt and pepper and you’ll have a winner. Here’s the thing with cooked greens, you don’t need a lot to get the nutrition you need. Unlike raw salad where you’ll need a cup or more to get a serving, with cooked greens 1/4 to 1/2 a cup is adequate. When I serve greens cooked like this, I usually serve them over rice. If I’m able to harvest a few vegetables, then I’ll just chop the leaves up and add them to the pan of vegetables. Attainable Sustainable has some great ideas on eating sweet potato leaves and making radish leaf pesto. Mother of a Hubbard shows us how to eat squash shoots. 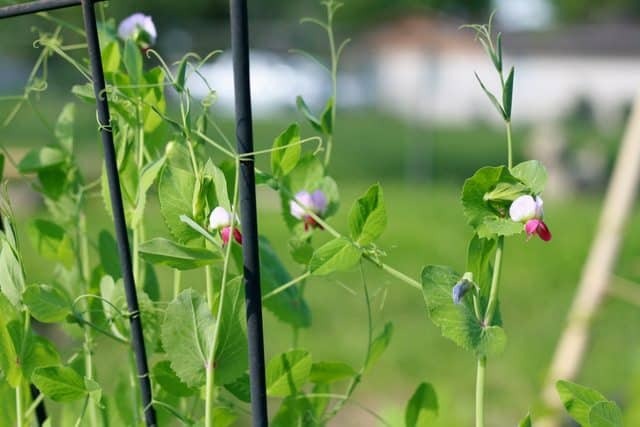 Reformation Acres is using every-little-bit of her pea harvest by making peapod soup. And the 104 Homestead is using broccoli stems to make hush puppies. Also, don’t overlook eating the flowers. Obviously, not all flowers are edible and you will want to double check before eating a flower you’re not 100% sure about ( for example, nightshade plants which are tomatoes, potatoes, peppers and eggplants do not have edible flowers.) But many plants do have edible flowers. Last spring we went to a banquet at our local Country Club for Phoebe’s dance company and they served some lightly steamed broccoli flowers on top of the grilled chicken. Most people thought they were just garnish instead of super tasty broccoli flowers and missed out. Broccoli, cauliflower, cabbages and leafy greens flower at the end of their season so there is no need to worry that if you pick the flowers you won’t have any fruit. I’ve not found these to be bitter although I’ve heard some people do. Fruiting vegetables are another story. They flower at the beginning so be sure to not pick all the flower or you’ll never get any fruit. For squash plants, there are male and female flowers. You can eat some of the male flowers and still get squash from the plant. The key to getting the most fresh eating from your harvest is to think beyond what you would find in the grocery store and really start thinking about what plants are in the garden and what your needs are for that day. Feel free to share how you’re eating your fresh organic harvest right now. Great stuff. I need to dig up my potatoes and find out when the sweet potatoes are ready. My garden was a near failure this year. I am so bummed. Ours hasn’t done as well as it normally does this year either. But there is always next year! 1) Do you have a photo anywhere of greens over rice? I know this should be a really simple concept, but it’s also so foreign to me, I’d love to see what this actually looks like in practice. 2) Do you have any tips for meal planning when you don’t really know what will be available in the garden? I’m so glad you found the tips inspiring. I have a post on sauted broccoli and cauliflower leaves that has a photo of the greens beside the rice,https://www.schneiderpeeps.com/sauteed-broccoli-and-cauliflower-leaves/. I usually just plop in top of the rice when I serve it but for the sake of a pretty photo I put it beside the rice. I keep meal planning pretty simple and I keep a well stocked pantry (and freezer). I plan the main dish but not really the vegetables. For instance we have chicken quarters and rice almost every week but the vegetable changes depending on what we have in the garden, pantry or freezer. 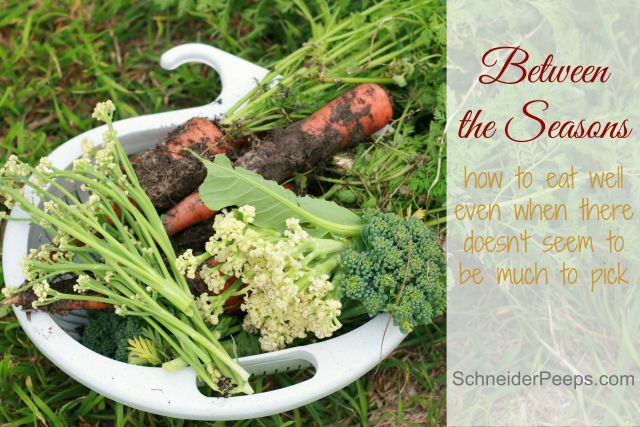 If we have something in the garden we use that, maybe it’s greens or sauted mixed vegetables. If we don’t have anything in the garden I’ll use canned green beans that I put up or frozen broccoli. I buy very little fresh vegetables for cooking but do buy frozen broccoli to keep on hand to fill in the gap. I can quarts of green beans from our garden for the same purpose. The vegetable in my meal planning is a wild card each evening but I usually know by noon or even the day before what it will be. I hope that helps.